A week before Christmas break, my sister and her colleagues at NIVA International Kindergarten made an agreement to include their students in their gift-giving. 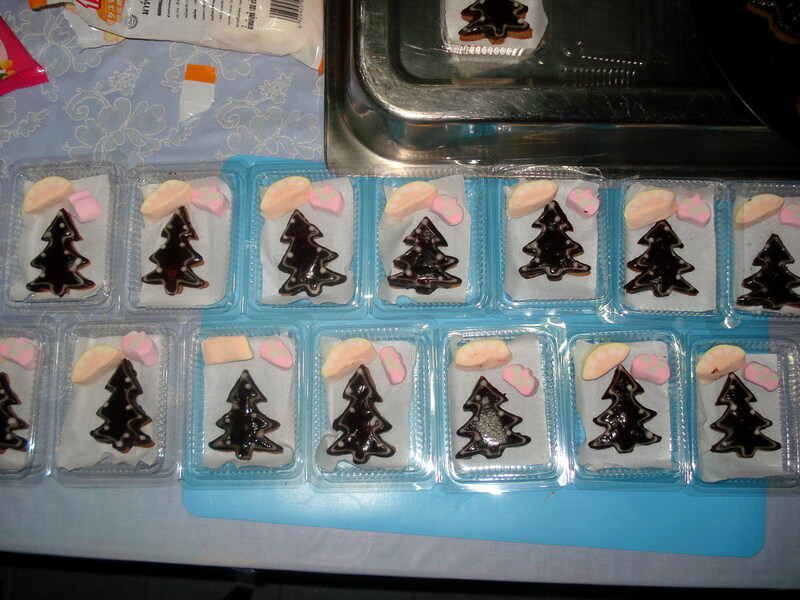 Each teacher picked a day when she would want to give her gifts. My sister picked the last day before the break. When she got home, she asked me to help her decide what to give. I convinced her to give something with a touch of Christmas. After some minutes of discussion, we settled on Gingerbread Christmas Tree cookie. 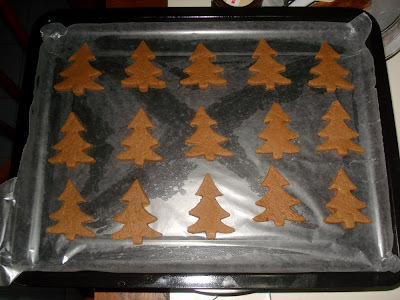 I combined 2 pounds of flour, 4 teaspoons of ground ginger, 2 teaspoons of ground cinnamon, a dash of nutmeg and 4 teaspoons of baking soda. I sifted them together into a large bowl. I placed the butter, syrup/honey and sugar over low heat and stirred the mixture until the butter melted. 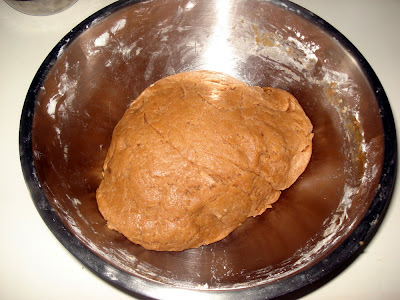 I poured the mixture into the dry ingredients, added the eggs and mixed them with a wooden spoon until a dough was formed. On a lightly floured surface, I kneaded the dough for a bit and rolled it out until 3 mm thick. 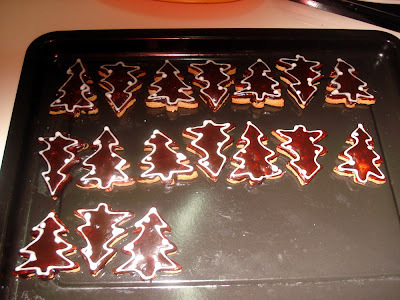 I stamped out Christmas tree shape with my cookie cutter and baked them at 160 degrees Celcius for 15-20 minutes or just until lightly browned. 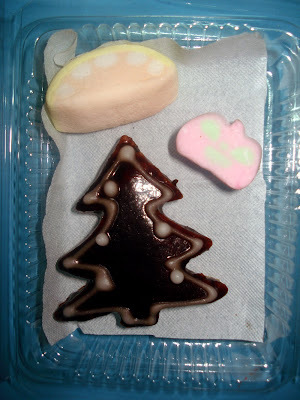 After cooling them for a few minutes, I dipped the top side of the cookie in a melted dark chocolate and used royal icing to pipe the border. I arranged them in a cookie sheet , covered them with cling film and chilled for a day before packing. 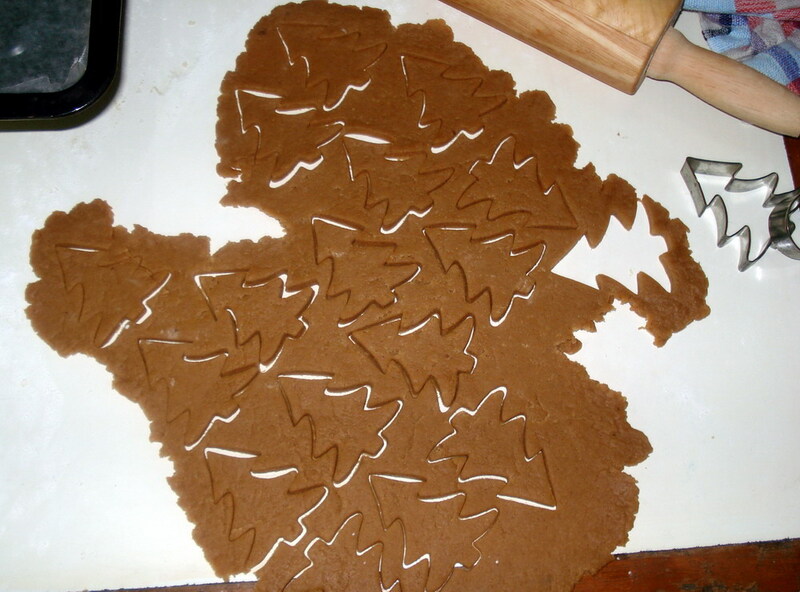 50 plastic boxes of Gingerbread and marshmallow treats were packed! They turned out well. The kids loved them!